Crédito Real has always been a bold and innovative organisation. In 2012, it took the step of becoming a publicly traded company, and obtained a listing on the Mexican Stock Exchange (BMV) the same year. Following this decision, the company expanded exponentially, achieving an accelerated level of growth that has allowed it to assume the leading position it now holds in the industry. For its work, Crédito Real is held in high esteem by both customers and the wider business community. Indeed, the company was recently given the Social Responsibilty Award for the fourth consecutive year and named an ‘inclusive company’ by the Mexican Centre for Philanthropy. It was also named a ‘great place to work’ by the Great Place to Work Institute, and became the best rated company for corporate governance according to BMV rankings. We expect to win many more accolades in the years to come, as the company continues to deliver results for a large and complex array of clients and businesses, while also investing in new and intelligent products. Though Crédito Real aims to serve a large market, it has been praised in particular for meeting the credit needs of the middle and lower-income sections of the population – two groups that have typically been neglected by the traditional banking sector. Crédito Real has been able to offer these demographics a flexible approach and varied products. As a result, the company reached a portfolio of roughly MXN 24.2bn ($1.3bn) in the first half of 2017. A large part of Crédito Real’s success comes down to its model for payroll credit. In an innovative move, the company’s portfolio now includes solid assets that belong to governmental institutions. This contribution of federal funds guarantees the service and payment of original credits within the portfolio. Other crucial moves by Crédito Real include its strategic acquisition of Instacredit, a personal loans company based in Costa Rica, and the purchase of Don Carro, a used car loans business in the US. During 2016, the company focused on achieving the growth objectives set for the year despite a challenging environment marked by unusually high volatility in key macroeconomic indicators. Fortunately, the landscape started to show signs of recovery and greater stability towards the second half of 2017. The beginning of this year was characterised by the strengthening of our balance sheet, the reduction of exposure to operational and market risks, and the quality growth of our credit portfolio in accordance with the company’s long-term goals. These achievements have been built on the concrete foundation of an orderly and stable operation. This is clearly reflected in our non-performing loan ratio of 2.1 percent, which is one of the healthiest and lowest in the Mexican financial market. Similarly, the company has received important support from its business partners, which is reflected in the expansion of our portfolio through high-quality assets. Also worth noting are the strict controls on loan granting that we implement as a company. Currently, around 27 percent of our credit portfolio comes from businesses outside Mexico: from Costa Rica with Instacredit, and the US with Don Carro’s five stores in Texas. In February 2016, Crédito Real acquired 70 percent of the capital stock of Marevalley, a Panamanian holding company with several entities operating under the Instacredit brand. Instacredit currently has a network of 70 branches: 56 in Costa Rica, 12 in Nicaragua and two in Panama, in addition to having more than 450 promoters. Instacredit is a well-recognised brand across Central America, with more than 15 years of experience, particularly with granting loans to middle and low-income segments of the population – those which Crédito Real aims to reach. Among Instacredit’s offered products are personal loans, automobile loans, SME loans and mortgage loans. The North American market has always represented great potential for Crédito Real, especially the Hispanic segment without credit history, which is a demographic close to 50 million people. For this reason, Crédito Real started operations under the Don Carro brand at the end of 2015, and acquired 65 percent of AFS Acceptance’s capital stock. AFS Acceptance is a company composed of 400 distributors of used and pre-owned car loans, and is licensed to operate in 40 states across the US. Our used car loans portfolio in the US now represents approximately 11 percent of the company’s total loan portfolio. In recent years, as a result of the 2008 financial crisis, it has never been more important for banking institutions to ensure their operations are as responsible and orderly as possible. Without consolidation across business practices, the sector risks another economic collapse. Fortunately, the international community has come to understand the importance of adequate and transparent management in publicly traded companies. Solid corporate governance in every single area of the company is the foundation for the effective functioning of markets overall, as it promotes credibility and stability, and contributes to accelerated growth and value creation. In this regard, Crédito Real has been an industry leader and an inspiration to others looking to improve their quality controls. Since its inception as a debt issuer, and following its IPO in 2012, Crédito Real has focused on strengthening its internal controls to ensure the efficient operation of the company. At the same time, the company ensures it complies with best corporate governance practices to safeguard the interests of its shareholders and other stakeholders. We believe that collaboration is key to promoting the company’s success, as well as that of the country. As a result, Crédito Real’s corporate governance is made up of a framework of values, rules and statutes that constantly regulate the operation of the bodies responsible for generating value for the company. These include the board of directors, four supporting committees (executive, audit, corporate practices, and communication and control) and a strict code of ethics and business conduct. Furthermore, most of Crédito Real’s committees have independent directors, and each is specialised in a specific area of global and national financial markets. Solid proof of the robustness of the company’s corporate governance is the award recently received from the BMV. Crédito Real was given the best rating among 80 issuers for corporate governance under the IPC Sustentable methodology. The future is very promising for Crédito Real. The company’s target market continues to have great penetration potential in Mexico, and its recent expansion into the US and Central America provides an opportunity to further strengthen its stratification and growth within its core business, which is focused on providing financial solutions to the population neglected by traditional banking institutions. The new digital era constitutes a powerful tool for improving access to financial services. Crédito Real has done its utmost to embrace the fintech revolution, collaborating with business partners such as ReSuelve and Credilikeme in order to bring forth new financial solutions through digitalisation. More and more fintech companies are gaining strength in the Mexican banking market, and Crédito Real is deeply involved with the movement. The fintech revolution is one that will not only enhance banking operations and accessibility, but the lives of customers too. 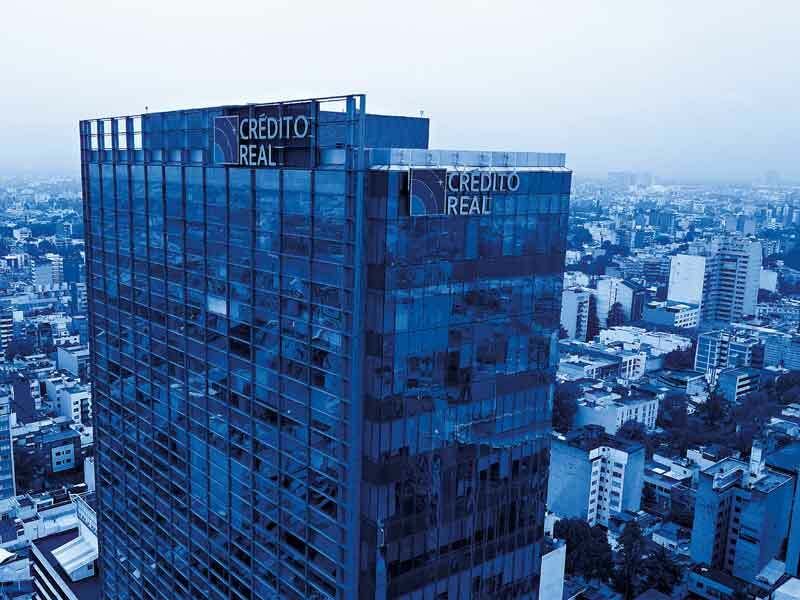 At the same time, Crédito Real is very close to accomplishing its objective of becoming the world’s largest non-bank financial institution serving the Latin American market. This ambition is supported by the company’s unique business model, and the synergies generated by its expert partners in the operation of different businesses and markets. Crédito Real will continue to build on its strength because of its people, for all those who depend directly or indirectly on it. Simultaneously, we will continue promoting equality, respect and growth in the banking sector. Likewise, the company will continue to support its customers in elevating their quality of life through a distinguished service that is reinforced by ethics and constant innovation, which, above all, helps them to go beyond their limits.